Privacy and data security are enterprise-wide issues that impact nearly every area of a company’s operations. 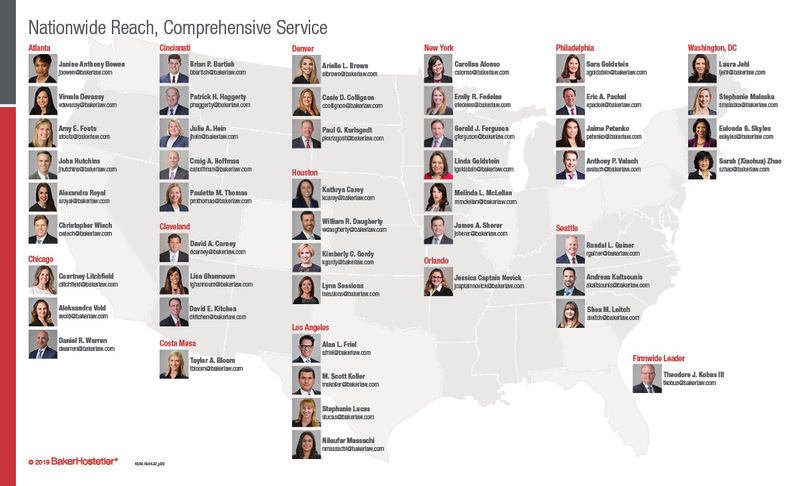 ­Clients of our ranked and award-winning BakerHostetler Privacy and Data Protection team count on us to continue to learn, grow and adapt to meet their needs in this constantly evolving area. Our core team of attorneys are not generalists, but rather focus on serving specific industries or issues so that we can deliver practical and service-oriented counseling. We serve clients from all tiers of the Fortune 500, as well as health systems, universities, small and midsize businesses, emerging technology companies, and state and municipal entities. Our team members are located in key cities across the United States and have global reach by maintaining strategic partnerships with lawyers, security firms and risk management companies around the world. Where does our competitive difference come from? It is our experience and our approach. Our attorneys are on-site at client locations hundreds of days a year proactively training incident response teams, conducting security and risk assessments, working through incidents, advising executive leadership teams and boards, preparing witnesses for depositions and regulatory investigations, and providing advice on new initiatives and transactions. We lead clients through the response to hundreds of potential security incidents a year. We respond to dozens of regulatory inquiries and defend dozens of lawsuits. Insights generated from our experience in incident response are set forth in our annual BakerHostetler Data Security Incident Response Report. Chambers USA ranks us in its 2016 edition, recognizing our “standout breach response practice” and “wide-ranging compliance advice.” According to the guide, clients say we are “super responsive, cost-efficient and don’t over-staff matters, which [they] appreciate.” And they note that we are “a very good law firm and I have enjoyed working with them.” Clients tell Chambers that our team’s national leader, Ted Kobus, is “one of the best around and has a great and expanding team.” Chambers also nominated us with a select group of firms for a 2015 Chambers USA Award as “Privacy and Data Security Team of the Year” for our outstanding work, strategic growth and client service excellence. Law360 recognized our team as one of the nation’s best practices when it selected us as one of its Practice Groups of the Year for Privacy in three consecutive years: 2013, 2014 and 2015. In addition, Law360 selected partner Craig Hoffman as one of three 2015 Privacy Rising Stars and partner David Carney as a rising star in 2015 for Privacy Litigation. Our team’s leader, Ted Kobus, was named a Law360 MVP for Privacy and Consumer Protection in 2013, and our Class Action Defense team leader, Paul Karlsgodt, was named a Law360 MVP for Privacy and Consumer Protection in 2014 and 2015. Defending a major casual dining restaurant chain with more than 400 locations and franchises around the world in a class action brought under the Illinois Biometric Information Privacy Act (BIPA). Plaintiffs allege employee fingerprints were improperly collected and stored. Representing a leading worldwide consumer credit reporting agency regarding payment card exposure issues following a data breach. Advising an international hotel chain after a payment card security incident that affected more than 300 properties worldwide. Defending an auto company in a consumer class action involving potential violations of the Telephone Consumer Protection Acts. Advising a leading United States airline and the world’s largest low-cost carrier regarding the potential effect of the General Data Protection Regulation (GDPR) on European ticket purchasers. Advising a casual dining restaurant chain based in the United States and with operations worldwide, on GDPR issues in connection with potential expansion to United Kingdom. Representing an American movie theater chain in an investigation by the Office of the Attorney General of the State of New York involving a mobile application that was potentially vulnerable to eavesdropping, which could have resulted in user information being intercepted, viewed or modified. Secured complete dismissal in putative class action alleging Cleveland Clinic Foundation and MD Anderson Cancer Center violated state and federal laws by transmitting information about consumers’ browsing history to Facebook. Handled incident response and regulatory and class action defense for Premera Blue Cross, after the largest cybersecurity incident involving medical information ever reported. Represented Schnuck Markets in all matters arising from a cybersecurity breach involving as many as 2.4 million credit cards. We obtained a declaration from the Missouri Attorney General that Schnuck did not violate any data security laws, are defending Schnuck in multiple class actions and have sued Schnuck’s acquiring bank and payment processor to enforce the merchant services agreement. On behalf of Eisenhower Medical Center, obtained a favorable ruling from the California Courts of Appeal that patient index data is not “medical information” as defined under the California Confidentiality of Medical Information Act (CMIA), after a theft of computers containing index data for more than 500,000 patients. Plaintiffs subsequently withdrew their lawsuit, with no payment by the medical center. Recognized Practitioner: Intellectual Property Litigation in District of Columbia (2018). Recognized Practitioner: Intellectual Property Patent Prosecution in District of Columbia (2018). Recognized Practitioner: Intellectual Property Trademark, Copyright & Trade Secrets in New York (2018). Robert Musiala Leads Webinar on "Blockchain 101"
Alan Friel, Scott Koller Discuss CCPA at Big Data Conference in Los Angeles. Eric Packel Presents Webinar on "Real Costs of a Cyber Breach"
Alan Friel Calls New California Privacy Law the "Advent of a New Era"
Will Daugherty to Discuss "Cybersecurity Measures: The Evolution of a Standard"
Laura Jehl Speaks at Risk Management Conference about "Blockchain Revolution"
David Kitchen, David Brown Alert on W-2 Scam Reprinted by "Legal Insider"
Eric Packel Blog Post on Facial Mapping Reprinted by "Computer Law Reporter"
Moustafa Badreldin Speaks on "Sweepstakes, Promotions and Marketing Law"
BakerHostetler Adds Longtime FinTech Privacy Lawyer as Partner in D.C.
Laura Jehl, Robert Musiala, Stephanie Malaska Author "Five Things Blockchain Firms Need to Know about the GDPR"
Webinar: GDPR Compliance and Beyond – What's Next? 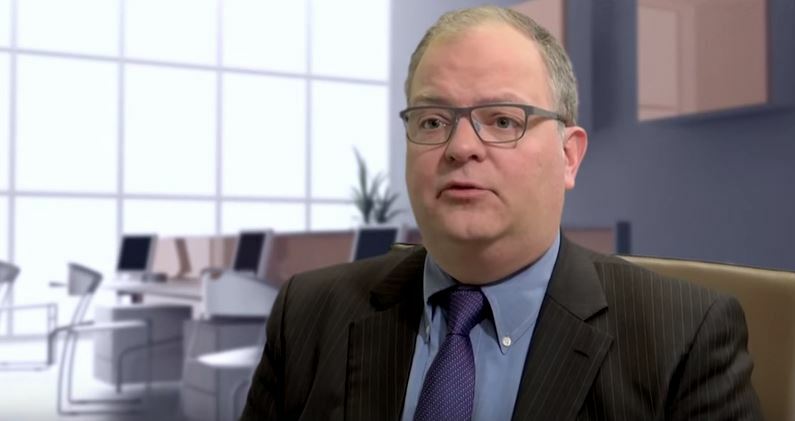 BakerHostetler Partner and National Leader of the Privacy and Data Protection practice discusses what questions regulators ask following an incident, what their expectations are, and the future of these investigations.